BBC Three - Free Speech, Series 2, Are We Getting More Racist? Are We Getting More Racist? Live from Sunderland, a panel of politicians and local activists discuss racism and Islamophobia in Britain in the light of events in Woolwich, where Lee Rigby was murdered. 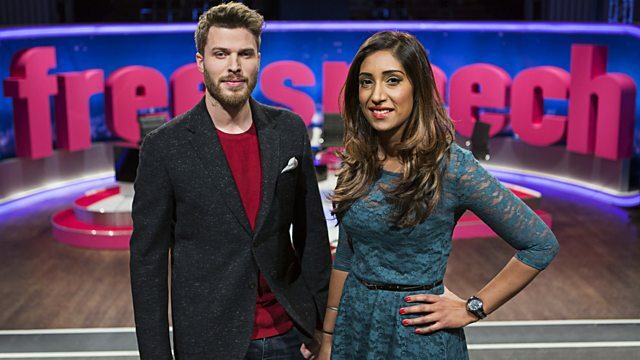 With Free Speech's social media audience generating the show's biggest-ever online debates on race issues arising from the murder of Lee Rigby, Rick Edwards presents a special live edition of the debate show in front of an audience of 120 people aged 18-25. Rick hears the opinions of the studio audience, with Tina Daheley (Radio 1 Newsbeat) relaying Twitter, Facebook and website messages from viewers at home. Live from Sunderland, close to the scene of the English Defence League's first march since the death of Lee Rigby, a panel of politicians and local activists discuss racism and Islamophobia in Britain in the light of events in Woolwich. Youth Unemployment: Are You Experienced?